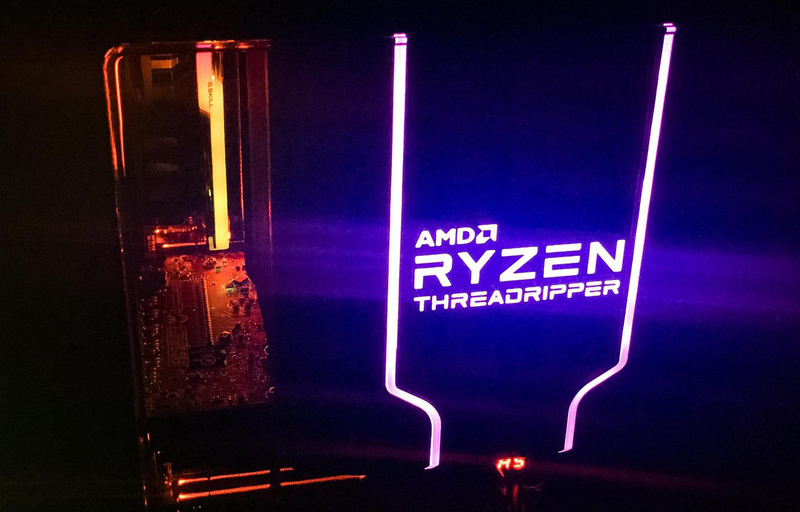 Shares of Advanced Micro Devices (NASDAQ:AMD) shot up by as much as 10 percent in after-hours trading this afternoon after the chip maker posted its fourth-quarter financial results. AMD met earnings forecasts but missed Wall Street estimates for revenue. AMD stock closed the extended hours evening trading session around 9 percent up at $21 which helped dampen the 12 percent slide the company has suffered through yesterday and today’s sessions. Rival GPU-maker NVIDIA (NASDAQ:NVDA) preemptively downgraded their revenue forecast which caused a semiconductor sector sell-off that caught AMD, among others. Most analysts and enthusiasts alike were prepared for the worst today from AMD. After all, CPU-rival Intel (NASDAQ:INTC) turned in a somewhat disappointing fourth quarter, and its graphics rival, NVIDIA slashed its forecast as previously mentioned. However, the Santa Clara, CA-based company gave investors a pleasant surprise in the guise of meeting some expectations, missing on some, but most importantly, they gave excellent long term guidance with some very promising indicators. Revenue was $1.42 billion, while up 6 percent from the same quarter a year ago, fell short of analysts expectations. Wall Street was looking for earnings of 8 cents per share and that’s exactly what AMD reported. In 2018, we delivered our second straight year of significant revenue growth, market share gains, expanded gross margin and improved profitability based on our high-performance products. Importantly, we more than doubled our Epyc processor shipments sequentially and delivered record GPU data center revenue in the quarter. Despite near-term graphics headwinds, 2019 is shaping up to be another exciting year driven by the launch of our broadest and most competitive product portfolio ever with our next-generation 7-nanometer Ryzen, Radeon, and Epyc products. 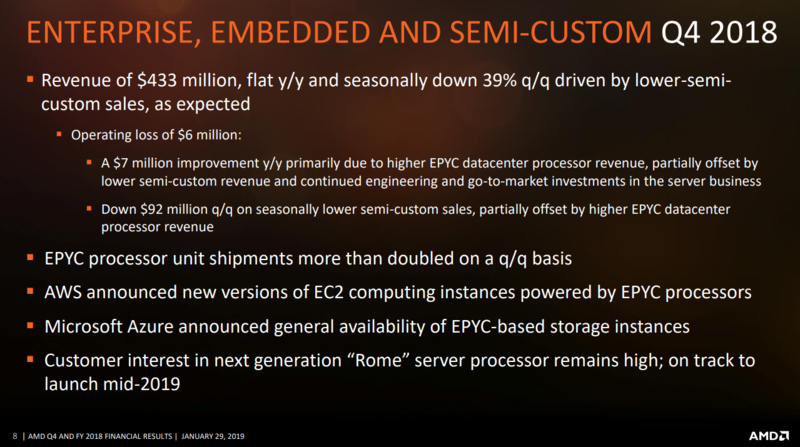 One of the most important facts given here is that EPYC has doubled shipments sequentially from last quarter which is exactly what AMD needs to happen if its going to achieve the ~10 percent of the $60B server market that its stated as a goal. Intel is currently the dominant player there with >95 percent of the market share. 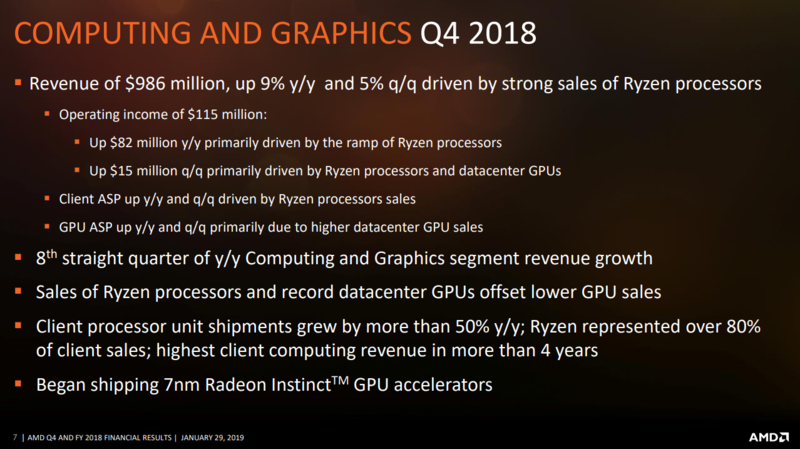 Ryzen is really taking over AMD’s ‘Computing and Graphics’ profit and loss ledger, a segment which includes keystone AMD products such as Ryzen CPUs, Radeon video cards, and Radeon Instinct GPU-compute cards. 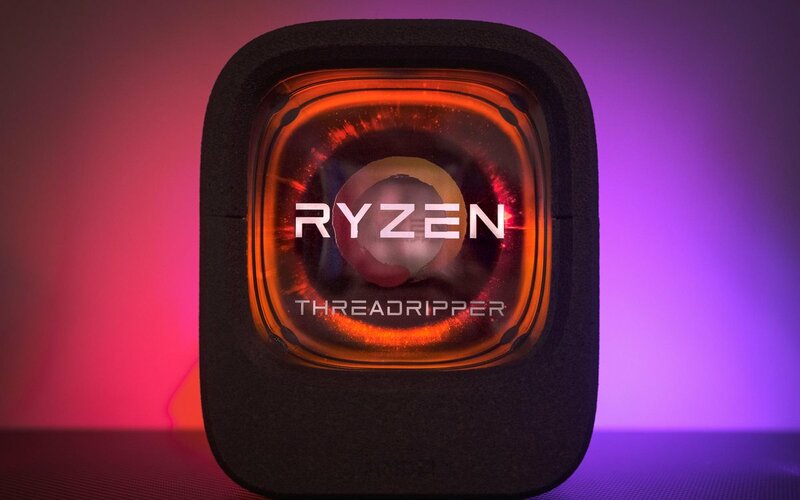 According to AMD’s numbers, Ryzen was the primary factor in increasing CPU sales by more than 50 percent and client CPU shipments are at a four-year high for the quarter. Ryzen now makes up over 80 percent of CPU sales for Su & Co.
AMD made no secret of the fact that a glut of video card inventory has hurt demand for its Radeon graphics cards. The second-hand market is still jam packed with cards purchased in 2017 and 2018 for cryptocurrency mining that are now getting sold off. For C&G, Ryzen is the star right now, and AMD is playing a waiting game as it brings 7nm Vega to market next month, and then looks forward to its upcoming Navi family later this year. EPYC is counted in the ‘Enterprise, Embedded and Semi-Custom’ group, a segment most famous for both the Xbox One and Playstation 4 families of SoCs. It’s not shocking to see numbers down for the unit as every fourth quarter sales are down seasonally as console purchase cycles are closely tied to pre-holiday shopping. AMD does point out here that EPYC has doubled in sales since the previous quarter, but since they don’t publish EPYC-specific numbers we can only speculate how many chips are getting sold. And if we were to guess we would say that volumes are still marginal, revenue for the group was flat year-over-year and while they do say EPYC helps offset the seasonal decline, the numbers don’t support strong EPYC sales just yet. Perhaps the primary theme today is not AMD’s financials from the previous quarter, or even its less-than-hoped-for guidance for the current quarter. AMD is in much, much better shape than it was just three years ago where it found itself cash-strapped and lacking any competitive products.They were forced to steeply discount expensive designs, and the only thing that saved the company were the contracts to both Sony’s PS4 and Microsoft’s Xbox, both of which probably didn’t offer great margins, either. Now AMD is seeing a surge in consumer demand for its Ryzen products that compete with Intel’s Pentium and Core lineups, and their real game changer for server and enterprise applications, the next-gen EPYC ‘Rome’ product will be launching in the middle of the year. Its been oft-cited that this first generation EPYC products was to prime major customers for a more wide scale adoption of its server products and we will see how that goes in just a few quarters. AMD now has $1.16 billion in cash and is doing well on its plan to pay down debt. Another encouraging note is the all-important gross corporate profit margins. Two years ago profit margins were in the mid-30’s; last quarter the firm booked its sales with 41 percent margins, and that’s very important improvement here. AMD is finally proving that it can increase the average selling price of its products while showing long term and consistent revenue gains. 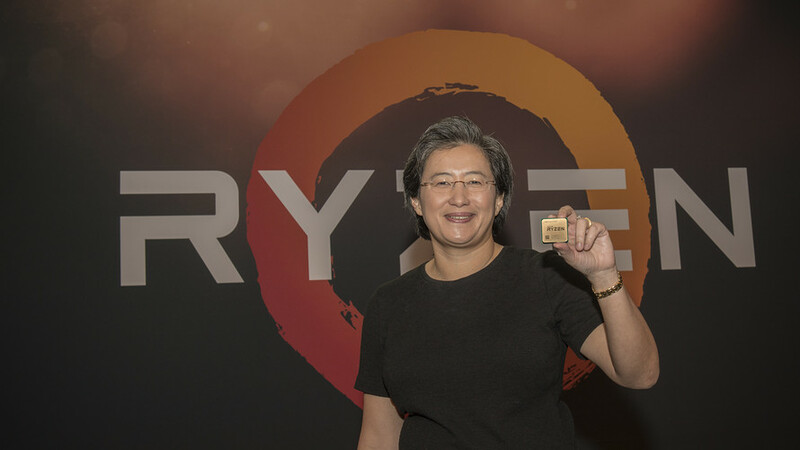 The spike in AMD’s stock price was buoyed further by AMD’s outlook that they would “grow their business by high single digit percentage” in 2019 versus Wall Street expectations of 6 percent for the year. Lastly, we got another tidbit of news today during the earnings call. The amendment provides AMD full flexibility for wafer purchases from any foundry at the 7nm node and beyond without any one-time payments or royalties. AMD can FINALLY simply go to the best fab it needs, in most cases TSMC but perhaps Samsung in the future, without paying fees to Global Foundries. So it appears the relationship is a bit more traditional and less strategic as the revised Wafer Service Agreement, the WSA, basically now just sets prices for 12nm and older processes that AMD will continue to fabricate some products with. AMD will still need to hit certain volumes on these 12nm/14nm products in order to not incur any penalties. That portion of the WSA runs out in 2024.